Turn Traumatic Stress into Posttraumatic GROWTH! This section is somewhat confronting as it draws together many aspects of trauma to provide an overall picture. It also uses more technical language than most of the book, to maintain conciseness for the purpose of the overview and briefly present what the clinical diagnosis may involve. The post traumatic stress process is a complex, phasic and variable natural reaction to an event that is outside the range of our usual human experience. The severity of reactions is understandable and a necessary process and should not be considered abnormal. We all play many roles in life such as, spouse, parent, child, employee, employer, friend, and have a hobby or sport that we also follow. When none of our usual roles encompasses the traumatic event, we are not adequately equipped to deal with the situation, and a healing process needs to be gone through, after the event. We will then be able to integrate the experience and develop a role that deals with the emotions and different reality that we now perceive. Another way to express this is that the development of skills, understanding, and a new role needs to occur to put the trauma into context, and find a new place in the global picture of our life and self-concept. The analogy of the jigsaw may explain this more clearly. Life can be viewed as a huge jigsaw. There is a complete picture of life, and ourself but it takes time, and trial and error, to learn where all the pieces go. A traumatic event seems to have the effect of blowing up much of the already completed picture that we have so painstakingly put together. Foreign pieces that don’t belong to the picture we had set out before the trauma, suddenly have to be found a place in the picture. As life is a gradual process most of the time, we have not learned how to manage and reassemble a sudden destruction of that picture. The way that we cope with rebuilding our life is to not look at all the destruction at once if we can possibly avoid it. Consequently, many pieces become temporarily lost from sight, forgotten about or just out of conscious reach. Suddenly, we are only equipped with a limited range of the resources that we had developed before the destructive event. A lot of time and energy needs to be invested to the rebuilding process. When sometimes we become overwhelmed by some of the emotions and memories (which will be described in later sections) it is because of the effect of surveying so much destruction and feeling the helplessness that we are left with on contemplating that reality. During the process of recovery, we may have times of being overwhelmed by symptoms and may not be able to function as well as usual. Counselling and support at these times can help us to reach a level of comfort and integration of the experience and post trauma symptoms. One of the ways of integrating and making sense of traumatic experiences is to re-do it in our mind, or even in reality in role play with other people, a number of times until we have `learned’ a way of managing. 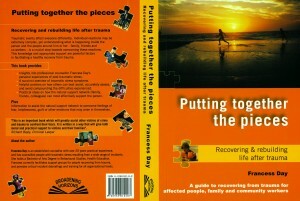 This process is described in Section Three on The Triggers and Barriers to Recovery. When our coping mechanisms are suddenly overloaded, a variety of defences, designed to protect the mind from permanent damage, are manifested. The issue of trust plays an important role in the whole process of humanly induced trauma. In many cases, trust in people generally is shaken or even shattered. The aftermath involves a lot of questioning of beliefs, including what is reality, and about the status quo generally. Our world view experiences something of an earthquake where our whole world is shaken up; some things are swallowed up in cracks, carefully built beliefs come crashing down, protective mechanisms are cracked or collapse. What used to be a fully functioning city block now has impassable roads, some buildings and services are gone and the view is suddenly completely different. Our view of our self is similarly affected. Suddenly we are acting completely differently. Certainly the internal experience is starkly different, even if we refuse to acknowledge any feelings or are simply in shock. We become unsure about what we will feel or what behaviours or events will happen next. Self trust becomes shaky and eroded as we struggle to get to know and trust our new self. It can be described as a sudden, emotionally charged introduction to a completely different person in some ways. As you can well imagine, this situation would be difficult and anxiety provoking in itself, both for the person and their family and friends. The body of this book provides an understanding of the issues involved with the clinical diagnosis of PTSD and what I refer to as the post trauma process. Robert Lifton from the Center on Violence, John Jay College of Criminal Justice, New York summarised 10 fundamental paradigms to assist our understanding of recovery issues. His work guided my early writings and assisted the drawing of my experiences into some structure initially. I have used quotes from his work throughout this book to support my own observations. Different paradigms relate to different types of trauma experiences and not everyone’s situation encompasses all the dimensions outlined. 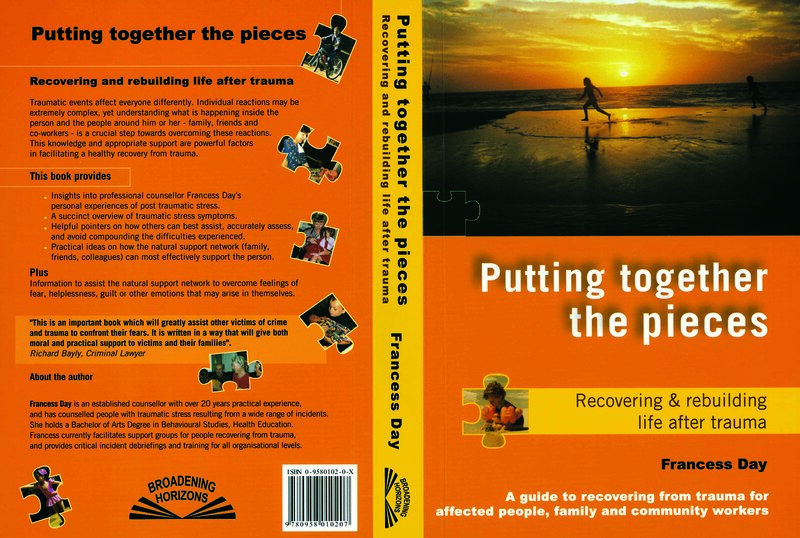 The challenge for therapists, rehabilitation counsellors and natural support networks is to identify what the person is experiencing at particular stages of their process of recovery. A word of caution about expecting people to experience usual paradigms: the person must initiate description of symptoms and verify meanings put forward by the therapist/counsellor. It is also very important to be aware that a person’s internal experience may be quite different from what is displayed or described outwardly. A calm controlled front may hide troublesome sleep disturbances, intrusive imagery and emotional numbness. It is vitally important to take people as they are and not intrude into their safety shell. People respond in many different ways at different times, so don’t assume that because one thing happens, another aspect described in this book will automatically follow or be associated. Allow the person to maintain as much control of his or her own life choices as possible. This will directly counteract the immensely overwhelming feelings associated with the trauma, especially helplessness, feeling out of control, surrender and shock, which are core issues associated with post trauma stress. Order the book online and check out Signs & symptoms in this PDF.